A mysterious plague, the Purple Death, ravages Earth. Dr. Zarkov, investigating in his spaceship, finds a ship from planet Mongo seeding the atmosphere with dust. 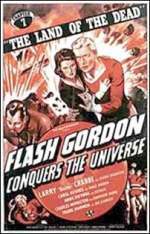 So Flash (Buster Crabbe), Dale and Zarkov go back to Mongo, this time with ready-made allies waiting: Prince Barin of Arboria and Queen Fria of the frozen northern land of Frigia, where polarite, antidote to the plague, is found.